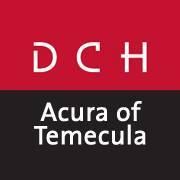 DCH Acura of Temecula is proud to serve the Temecula, Escondido, Carlsbad, San Diego, & Riverside region with quality Acura vehicles. With models like the TL, ILX, MDX, RLX, RDX, TSX Sport Wagon, and TSX, we have something for every taste, and every need. Come visit us to see our vehicles and take one for a test drive. Our friendly sales associates will walk you through the model of your choice so you can ensure it’s the perfect fit for you. If you’re looking for a Temecula used car, we can assist you there as well. Visit our used car inventory page to see the large collection of preowned vehicles to select from.DCH Acura of Temecula is not just a good choice as your Temecula & San Diego area Acura dealership, we also provide a full line of services dedicated to our Riverside, Escondido & Carlsbad area California customers. From auto repair performed by expert mechanics, to OEM Acura auto parts, to auto financing assistance, DCH Acura of Temecula is the smart choice for your next vehicle, or other automotive needs.